The growing popularity of plant-based dairy alternatives has given rise to industry debate over the use and definition of the word, as beverages such as almond milk, coconut milk and oat milk are rapidly evolving into household staples. Once a minuscule subcategory fueled by vegans, vegetarians and consumers with dietary restrictions, plant-based “milks” have gone mainstream, with their taste, nutritional value and reduced environmental impact—compared to their dairy counterparts—appealing to consumers of all diets and demographics. Yet the U.S. Food & Drug Administration (FDA) defines milk as “the lacteal secretion … obtained by the complete milking of one or more healthy cows,” impelling the National Milk Producers Federation to launch a campaign, with support from members of Congress, to prevent plant-based brands from labeling their products as milk. Introduced in January 2017, the Dairy Pride Act would require the FDA to enforce its definition of milk under the claim that the loose use of the word is inaccurate and misleading to consumers. But perhaps the dairy industry’s root cause for concern is that plant-based brands are taking over the dairy case. Retailers are dedicating greater shelf space to milk alternatives and dairy-free beverages, leaving dairy sales spoiled. From 2000 to 2016, per capita consumption of fluid milk beverages decreased by nearly 22%, according to a report by Rockville, Md.-based Packaged Facts titled Dairy and Dairy Alternative Beverage Trends in the U.S., 4th Edition. Also, according to the latest research from New York-based market firm Nielsen, the compounded annual growth rate (CAGR) of milk over the past four years has dropped 3.4%, while that of milk substitutes has risen 7.7% over the same period, with almond milk and coconut milk in particular increasing 14% and 9.3%, respectively. 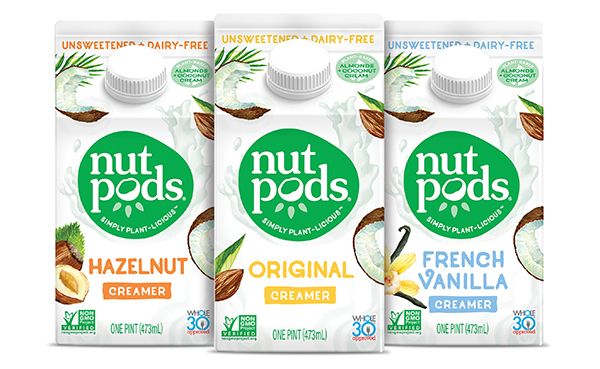 While demand for plant-based milks is rapidly increasing, the precedent for dairy alternatives was set decades ago with the introduction of soy milk and rice milk, which served as early pioneers of plant-based beverages, says Madeline Haydon, founder and CEO of dairy-free half-and-half alternative Nutpods, based in Bellevue, Wash. But as more consumers embrace dairy-free alternatives, regardless of dietary needs, soy milk and rice milk, too, are losing out as seemingly endless plant-based options come to market. The CAGR of other milk substitutes has increased a whopping 90.6% over the past four years, per Nielsen data, while that of soy milk and rice milk has dropped 6.6% and 12.1%, respectively, over the same period, making way for new varieties, from hemp milk to flax milk to even pea milk. 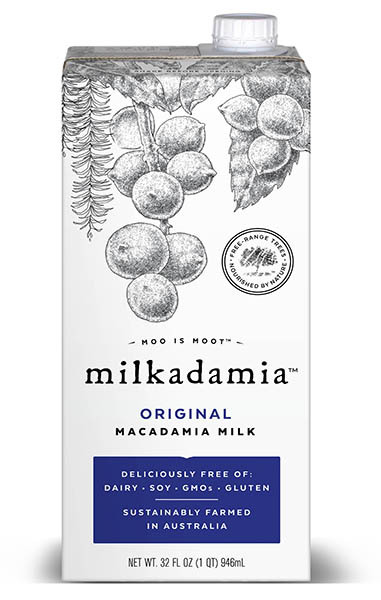 “What’s most striking is the rapid growth in volume for nondairy beverages and the corresponding rise in choice offered,” says Jim Richards, CEO of Burr Ridge, Ill.-based Jindilli Beverages, producer of macadamia nut milk brand Milkadamia. First introduced to coffee shops in 2015, Milkadamia has since expanded to grocery retailers including Walmart Inc., which recently launched the brand’s new refrigerated line, merchandised alongside traditional milk products. Torn between appealing to consumer demand and minimizing consumer confusion, some retailers have begun to label dairy-free milk alternatives as “drinks” or “beverages,” instead of milk, such as Monrovia, Calif.-based Trader Joe’s, which offers dairy-free Trader Joe’s Cocoa Almond Cashew Beverage. Other grocers focus instead on informing the consumer of the difference between cow’s milk and plant-based milks. PCC Community Markets, for instance, features a detailed list of dairy alternatives on its website, highlighting the flavor, texture, nutritional value and uses of eight plant-based varieties. The shift from dairy products toward plant-based alternatives largely revolves around health concerns, because consumers increasingly perceive plant-based foods to be healthier than animal-based products. Moreover, according to Nielsen, plant-based beverages can be a point of entry to functional ingredients. “As consumers become increasingly aware of the role nutrition on their health, coupled with the FDA and World Health Organization’s recommendations to reduce added sugars, consumers are voting with their wallets and choosing to buy better-for-you products as an investment in their health,” Hayden says. According to Nielsen’s 2017 Category Shopper Fundamentals Survey, 33% of consumers said that artificial-ingredient-free was important when purchasing nondairy milk. Plant-based alternatives such as Nutpods and Milkadamia tout their nutrition labels, which feature low sugar content, fewer calories and free from unhealthy additives to appeal to health-conscious consumers. But milk alternatives aren’t the only plant-based products consumers are turning to for nutritional value. Natalie’s Orchid Island Juice Co., based in Fort Pierce, Fla., offers small-batch, clean-label, minimally processed juices free from artificial ingredients, preservatives and GMOs. Similarly, better-for-you-beverage provider ALO Drink boasts a lineup of organic aloe vera juice, derived from a sustainable farm in Thailand. Its products are Non-GMO Project verified, gluten-free, fat-free and contain nof artificial flavors, colors or preservatives. “Sourcing is becoming a large part of what consumers are seeking to understand,” says Drew Pawlan, sales and marketing associate for San Francisco-based ALO Drink. “Transparency in how products are made, and the quality of ingredients used, will become more and more demanded by consumers of plant-based products,” and programs like the Non-GMO Project, as well as greater transparency in the sourcing of grass-based products, will become the norm, he says. Plus, growing consumer concern over animal welfare and environmental impact has also contributed to the rise of plant-based beverages. While plant-based brands have been the primary target of the dairy industry’s campaign to promote milk consumption in the U.S., innovative dairy brands have not been excluded from the controversy. Earlier this year, the a2 Milk Co. found itself as the latest victim of backlash from the National Dairy Council, which claimed the brand’s A1 protein-free milk has “no nutrition or health benefits beyond regular milk,” according to a company statement. “What is it going to take to get the American dairy industry to embrace disruptive natural innovations like a2 Milk that can help reverse the decline in dairy consumption and make a meaningful difference to peoples’ lives?” said Blake Waltrip, U.S. CEO of the Australia-based brand. Founded in 2000, a2 Milk is a dairy product derived from cows that naturally produce milk with only the A2 protein type vs. conventional cow’s milk, which contains a combination of A1 and A2 beta casein protein types. Research has found that proteins in milk affect some consumers’ health differently, and that a2 Milk is easier on human digestion compared to conventional milk, according to the company. Consumer demand for plant-based milk alternatives can in part be attributed by dietary restrictions; an estimated one in four Americans struggle with digesting conventional dairy milk. But a2 Milk provides an alternative for these consumers while still supporting the dairy industry. The company has distribution in more than 3,600 stores across the U.S., including Wegmans, Stop & Shop, Whole Foods Market, Sprouts and Safeway.